Wendi Aarons says out loud the things I can only mumble quietly to myself. She is bold and sharp and wickedly funny. She is also a member of the Barry Manilow International Fanclub, and has the lapel pin to prove it, which makes her good people in my book. Her Food Memory originally appeared on her web site on 16 May 2007. 1. Start with $10 of organic chicken breasts. 2. Plan to make baked chicken for dinner. Recipe says to dip chicken in egg whites, then coat in bread crumbs and put in oven. 3. Search frantically in pantry for container of bread crumbs. When no bread crumbs seen, substitute crushed bag of Cheese Nips found under soda bottles. 4. While chicken bakes, pat self on back for being an innovative, creative cook. 5. Proudly serve family Cheese Nip chicken entrée. 7. Watch ungrateful family happily eat Cheerios and Pirate’s Booty for dinner. 8. Clean up kitchen and stare morosely at weird, orange chicken breasts that are now silently taunting you. 9. Start drinking and plotting. 10. Forcefully grab biggest knife in the kitchen. 11. Take a deep breath, raise knife over head, then hack the crap out of the goddamn chicken breasts like it’s Fight Day at the San Dimas Woman’s Correctional Facility and you’re just a few stabs away from being crowned the cell block champ. 12. Decide to make soup. While grabbing matzo ball mix from pantry, finally find container of bread crumbs. Slap it hard. 13. After soup comes to a boil, drop in matzo balls and demon chicken chunks. 14. Tell family you have a surprise for them. 17. Say good-night to family. Turn thermostat to 60 degrees and sit in dark room eating soup. 18. Wonder if this is how Lee Harvey Oswald started. 19. Finally give in and throw soup in garbage disposal. As Chik Nips are cruelly ground into oblivion, scream “So long sucker, see you in hell!”, then wash dishes. 20. Happily eat Cheerios and Pirate’s Booty for dinner and plan on dining out indefinitely. BAH Note: I couldn’t replicate the demon chicken chunks she used to fancy up the matzo ball soup mix and it’s ok if you don’t either. Fortunately, my recreation of her recipe did not include Step 9, Step 15, or Step 16. Combine the egg and oil in a medium bowl. Beat lightly. Add the matzo ball meal and stir to moisten. Place the bowl in the refrigerator for 15 minutes. Meanwhile, bring the water to boil over high heat and add the soup seasoning packet. 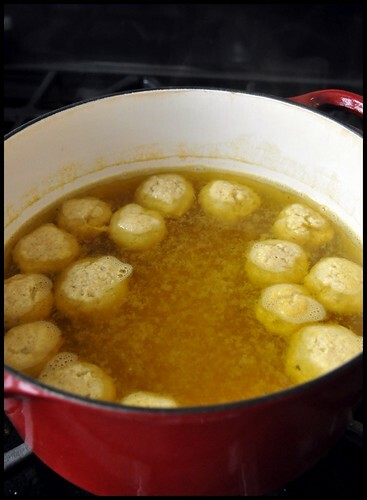 Wet your hands and quickly roll the matzo meal into one inch balls. Once all the balls are rolled, drop them into the boiling soup, cover the pot, reduce the heat and simmer for 20 minutes. I agree Kitch. Wendi Aarons is a gem. Actually, I was thinking ( and bought the stuff for ) about French Onion soup. With crusty bread and melty brie…HOWEVER, as the temp is in the 90’s here the spouse may commit me if I serve him that after a 1/2 hour car park on the 410. Emily, it’s gawd awful hot here too. Maybe instead of french onion, you should try that curried zucchini soup I posted a few weeks back. It was good chilled.